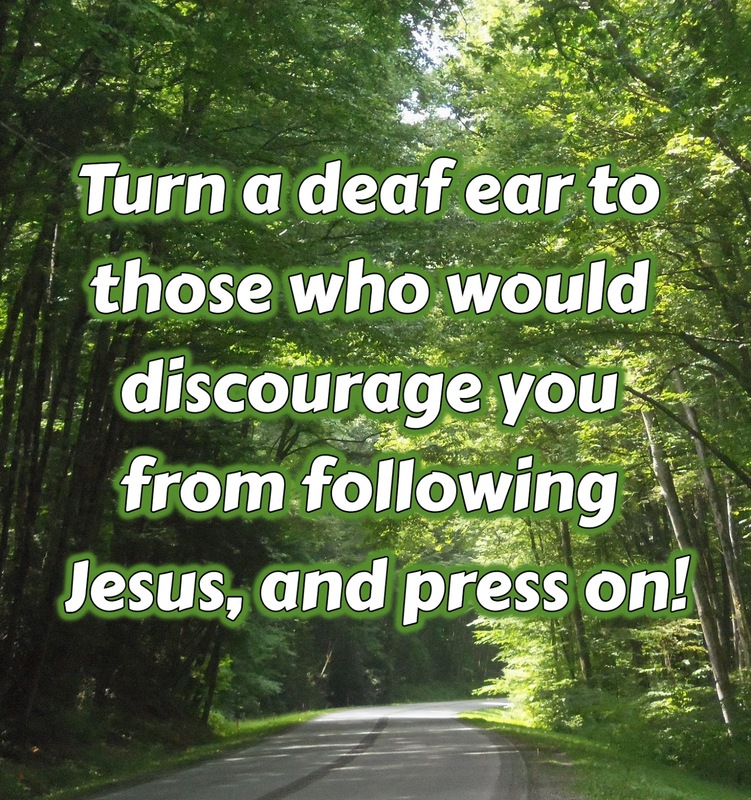 Biblical Minimalism: Put Your Fingers In Your Ears, and Press On! There are those in all our lives who do not share our vision of Biblical and/or minimal living. There are also those who secretly long for what we are pursuing but are unwilling to pay the price and give up the things this kind of life requires, some of whose influence may sidetrack or derail us from our own mission. We may find that there are few who really understand why we do the things we do, and it may feel like we are walking alone. I think the thing we need to remember is that Jesus’ way of life has never been popular because it requires the denial of self and living in a way that is polar opposite to the way the world around us lives. When I think of this fact, I often picture Christian in John Bunyan’s “Pilgrim's Progress.” As he began His journey toward the Celestial City, he was mocked by those who didn’t understand the radical stand he was taking and his yearning for the life he felt called to live. As they taunted shouts of discouragement, Christian put his fingers in his ears and ran forward, crying out, “Life! Life! Eternal life!” This is what we are all going to have to do if we are to run a successful race toward our heavenly home. We must turn a deaf ear to those who try to derail us and attempt to persuade us to turn back to our old way of living. There comes a point in all our individual Christian journeys where we must learn to identify the difference between God’s approval and the approval of others. What others think of us is irrelevant in the grand scheme of things. Whether they applaud or dissuade our efforts truly shouldn’t have any effect upon the decisions we make or the path we take because God is the only one we are required to please. It is His Word that we will be measured by when we stand before Him at the end of life. The path toward Heaven grows increasingly narrow as we continue to grow in grace and the knowledge of who God is. His holiness shines a consistent light upon our path revealing things about our nature that are contrary to His righteousness. If He were to show us everything at the beginning of our response to His call to follow Him, it would overwhelm us to the point that we would never start. If Peter had seen that following Christ would eventually cost him to be crucified upside down, could he have mustered the courage to say “yes” that first day of meeting Jesus and hearing His call to follow Him? In that moment of Jesus’ original call, all Peter really knew is that he felt compelled to lay down his nets and way of life and walk away from it all to follow Jesus. But, oh the things he ended up needing to learn and go through between that initial moment of responding to Jesus’ call and the moment he not only found himself facing crucifixion but even asking the soldiers to crucify him upside down because he felt unworthy to die in the same manner Jesus did! As you read through the Gospels and the book of Acts, you can clearly see the gradual tempering process and transformation that took place in Peter’s life as Jesus and the Holy Spirit led him from conversion-level faith to the ultimate place of being able to willfully die a martyr’s death. Thank you for another helpful post, dear friend. Wonderful post dear Cheryl. Coming from someone that has struggled from being a people pleaser I totally agree. It is GOD'S APPROVAL that counts! I have learned this the hard way. But Christ has shown me over and over again that when I please Him....all is well with my soul. Hugs and blessings dear lady. Yes, indeed ~ God's approval is ALL that matters, my friend. God bless you! Cheryl, thank you for your encouraging writings and posts. My prayer is to seek God’s approval not man’s. Blessings sweet friend! Hi Cheryl, Thank you for this reminder that we must be intentional about being God-focused with an eternal perspective. I was convicted and encouraged. Your obedience to share that which brings us to a closer walk with the Lord is well-pleasing to Him. Your testimony both through your blog and through your life, your struggles and your victories, bring our Heavenly Father so much Glory. You are such a dear blessings. Oh, dear friend! This comment was such an encouragement to me tonight! Thank you ever so much for your constant support and kindness to me. May the Lord richly bless you!